Just as the discounted Halloween candy is cleared off the shelves, it's time for novelty Christmas stuff to grace them. 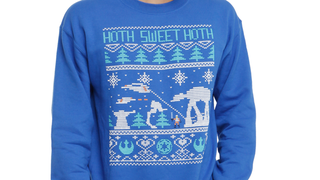 Get ready for two months of faux-ugly-sweaters, kicking off with this... err, delightful Star Wars design from Hot Topic. Forgive me if I'm missing the point, but I thought an 'Ugly Sweater' was something you were forced to wear because it was lovingly knitted by your Grandma or what have you. Why on earth would you go and buy one? Arguably this isn't even a Sweater going by the actual terminology, more of a sweatshirt, so this is just confusing on multiple levels. Oh well, I'm not here to judge, so buy away if you so please - this retro-styled design, naturally depicting the wintry environs of Hoth (Sweet Hoth) is available now from the clothing retailer for $30. Get ready for two months of things like this guys.